This is getting totally out of hand. 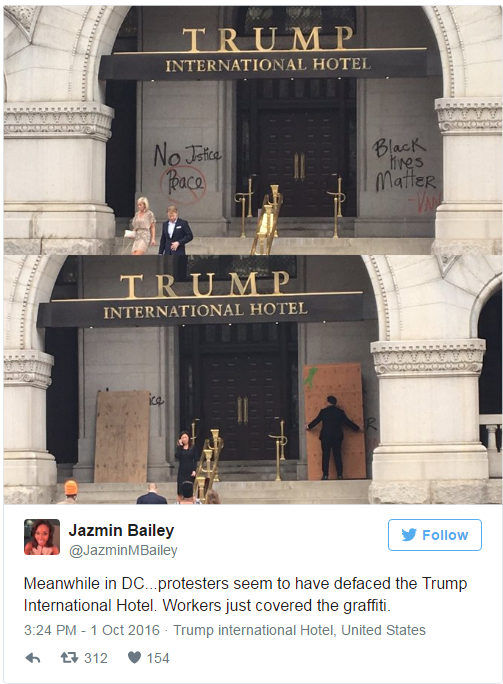 Some Black Lives Matter thug stood in front of Trump International Hotel and spray painted graffiti on the building, defacing it. A young man called the police on the goon, while others verbally warned him that the police were being called and yelled, “Black Lives Matter!” I fear we are dangerously close to civil unrest and a race war and this indicates that. It doesn’t matter whether you support Trump or not… you don’t have the right to damage personal property that way. You also don’t have a right to kill or beat people… you don’t have a right to loot and destroy stuff either. I hope the police catch this dirt bag and fast. The last thing we need is for BLM to see this work and to have it spread. If that happens, it’s only a matter of time until someone gets killed. A vandal was caught spray painting graffiti on an entrance of the new Trump Hotel in Washington, D.C. late Friday night or early Saturday morning, Politic365 reported. Video of the vandal’s activity was posted on Twitter October 2. Onlookers noticed the what was happening as the man finished spray painting and walked away without being stopped. The words “Black Lives Matter” and “No Justice No Peace” were spray painted on the walls in large letters. Hotel staffers used plywood on Saturday morning to cover up the damage. The Trump International Hotel Washington, D.C. opened last month and is a 263-room hotel located at 1100 Pennsylvania Avenue. The building was once the historic DC Postmaster General’s building and Trump’s organization was given a 60-year lease by the federal government to restore and convert the building. The hotel’s official opening is expected in late October. Black Lives Matter activists are responsible for millions of dollars of public destruction and dozens of attacks on police and innocent pedestrians. They are attacking not just Trump supporters, but white Americans and police officers across the country. 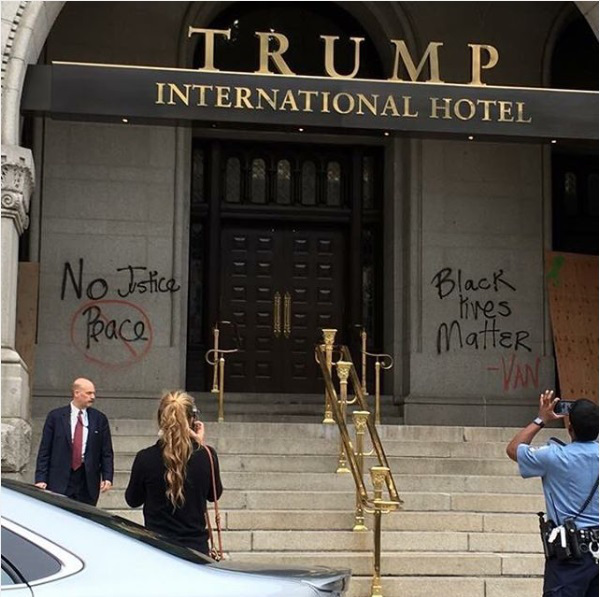 The graffiti says “Black Lives Matter” and “No Justice, No Peace.” Workers at the hotel covered up the messages with pieces of plywood on Saturday morning. One of the things I agree with Trump on is strongly supporting the police and the rule of law. Evidently, BLM would rather have anarchy in the streets and they think that black people should never be arrested or held accountable EVER. Oh, and they really hate Donald Trump.